As you know, we LOVE Disney World! However, Disney World is expensive. With a 1-Day Pass starting from $99 per person, so you can spend over $400 for a family of 4. There are lots of activities to enjoy around the Walt Disney World Resort that are free or nearly free. Why not try one or several of these adventures that are FREE at Disney World. You will save money and still have those amazing family moments. 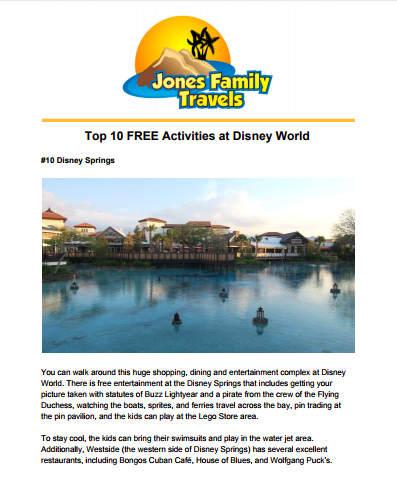 Click here to download the Free Activities at Disney World pdf! 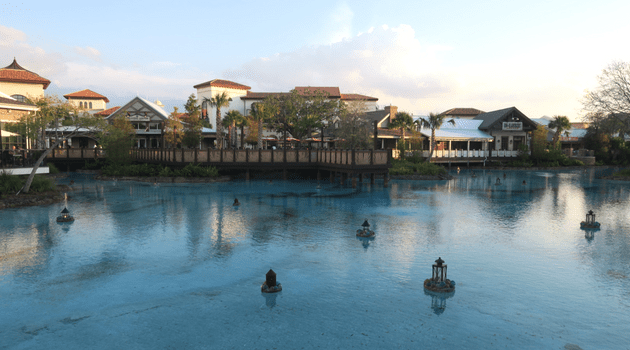 You can walk around this huge shopping, dining and entertainment complex at Disney World. There is free entertainment at the Disney Springs that includes getting your picture taken with statutes of Buzz Lightyear and a pirate from the crew of the Flying Duchess, watching the boats, sprites, and ferries travel across the bay, pin trading at the pin pavilion, and the kids can play at the Lego Store area. While you’re here, Disney’s Fort Wilderness Resort has some of the most scenic and lengthy walking paths of any resort on Disney property, so get out there and enjoy some fitness in the beautiful Florida weather. Spend an evening in a hammock on the beach at Disney’s Polynesian Resort, while you watch the Electrical Water Pageant. This fun water parade runs in front of Disney’s Grand Floridian Resort, Disney’s Polynesian Resort, Disney’s Contemporary Resort, Disney’s Wilderness Lodge Resort, and Disney’s Fort Wilderness Resort, nightly. Just a little trivia, did you know the Electrical Water Pageant is the longest running parade in Disney history. 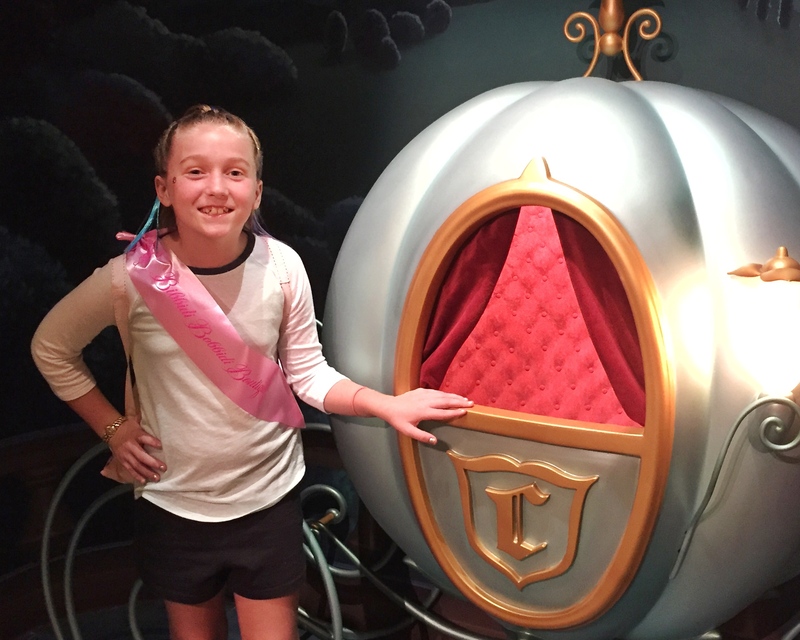 10 FREE Activities at Disney World! You can watch the Happily Ever After Fireworks at Magic Kingdom from the Deck at Disney’s Contemporary Resort. This is an amazing view of the fireworks above Cinderella Castle. You can also extend your time at Disney’s Fort Wilderness and grab a chair on the beach to watch the Electrical Water Pageant and Happily Ever After Fireworks. You can take a ride on the monorail loop to see some of the Walt Disney World Resort. This is always a fun ride for the whole family. We had a friend that always took her younger kids to Disney World to only ride the monorails. Her kids loved it and thought Disney World was the monorail ride. As a Disney fan, you may have wondered “what is it like being a Disney Cast Member?” Check out our blog post about funny guest stories as a past Disney Cast Member.